Chris Camp welcomes you to Aquamaster Water Treatment Ltd. Established since 1975, specialises in the supply and installation of domestic and commercial water treatment systems, water softeners, Commercial reverse osmosis systems, water filtration systems, Purification systems, and UV water treatment systems. We also carry out chlorination of new cold water mains pipes, cold water storage tanks, hot and cold water systems, and Legionella Risk Assessments. 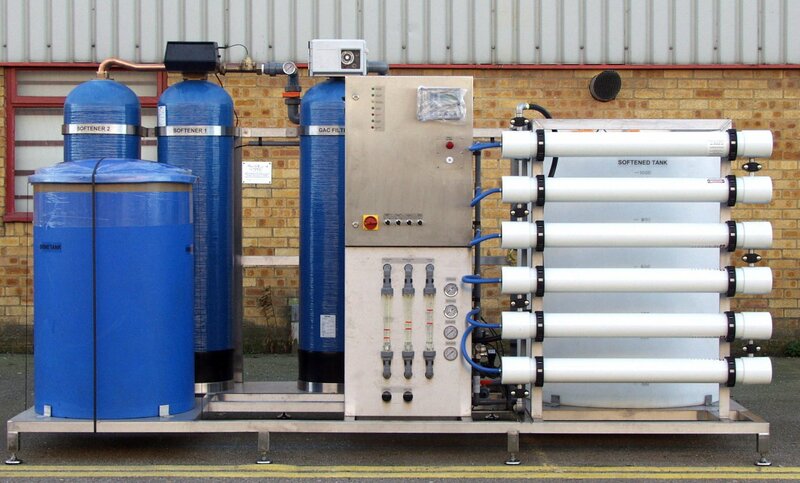 We can offer maintenance plans for commercial reverse osmosis filtration water treatment systems, and domestic users. We can service most makes and models of commercial or domestic water softeners and reverse osmosis systems. With customer satisfaction our top priority, we aim to provide customer service by supplying top quality equipment and products for both Residential and Commercial application. We can also treat more difficult and complex water treatment problems, including well water/ bore hole filtration and purification systems, Brackish water reverse osmosis systems, Salt water RO systems, Muddy water filtration systems, Bacteria, High levels of Iron, Nitrates, Manganese, Hardness from lime-scale,acid water, and many other complex problems. As one of the standard technologies in filtration and purification, a reverse osmosis filtration systems (RO Water purification ; is widely used within commercial, industrial and domestic environment. This Technology has been utilised for many years and has proved to be one of the best forms of water treatment purification in the world. Reverse osmosis filtration systems are the process of purification whereby the impurities in the water are removed. This is carried out by the raw water going through the Reverse osmosis semi-permeable membrane, this divides the concentrate ( sometimes called reject water ) and the permeate water into two separate areas. The reject water comes out of the membrane and goes to the drain, but can also have a percentage returned back into the membrane to go through the process again, this can reduce wastage. The permeate is then used for various applications. On a industrial reverse osmosis filter system its normal for a percentage of the reject water to be be reticulated back into the bank on membranes, to save on wastage. 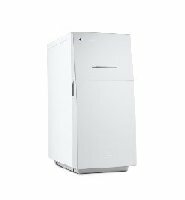 ;Of course there are many other forms purification besides these systems, and the choice of which to use is ultimately down to the requirements of the water treatment application and the level of filtration and purification required. Reverse osmosis filtration systems are used allot in residential properties, which are also called ro filters.These reverse osmosis systems are just what you and your family need in order to remove various contaminants from your drinking water. RO water filter systems can be used to treat well and bore hole applications, and city water. Not only will you get crystal clear and fresh tasting water. it will also be beneficial for your health. The amount of impurities in some water can be very high without you knowing about it. Most people take it for granted that their drinking water is safe to drink, this is defiantly not always the case. A standard domestic reverse osmosis filtration system will fit in the base cupboard under your kitchen sink. Your reverse osmosis filter system consist of a filtration module, this normally will have between 3 and 6 stages of filtration. and a ro pressure storage tank. 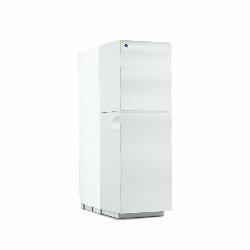 For people who are very heath conscious and take their heath seriously, there is an addition post re-mineraliser filter that can be added to your reverse osmosis system. This gives the benefits of adding minerals back into the ro filtered water. 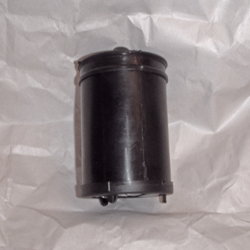 A domestic ro filter system is normally a straight forward installation process. It can take two or three hours to complete the installation. One thing that is important with any reverse osmosis system, is the water pressure. You need a minimum pressure of 35 to 40 psi for the ro filter membrane to work efficiently. If this is not the case, you can install a small pressure pump, this will maintain the pressure on the ro membrane and give a better production and reject rate. Once your reverse osmosis filtration system has been installed for some time. 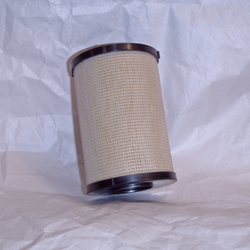 The next consideration is the servicing and replacing of the filters. This service work is normally carried out every six to twelve months depending on the raw water quality. It is also a good idea to have this service work carried out, as it is important to keep your system working well, so you can continue drinking good quality water. 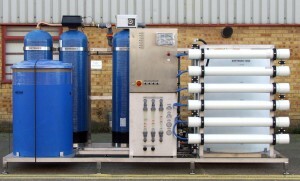 Replacement filters for the Bluewater PRO 400 range of reverse osmosis systems. 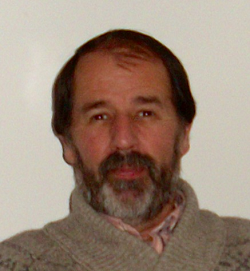 There are many people who have well or bore hole system that produce brackish salty water. This brackish water can quite easily be treated with a reverse osmosis system, this will treat the whole house. Normally it is a good idea when using RO water for all the requirements in a property, to have a neutraliser fitted as a post treatment system. RO water tends to have a lower PH, so needs to be neutralised to prevent and corrosive effects in the appliances and pipe work. We carry out water treatment work throughout Cambridgeshire, Bedfordshire, Hertfordshire, Outside these counties, Please Call. We also export water treatment systems to other countries.